Perfectly cut, flawless round brilliant diamonds surround the rare fancy cut 8.8ct oval amethyst. 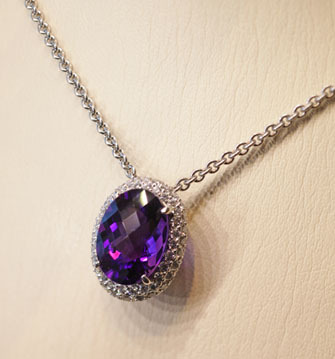 Mined in Africa and cut in Germany, the amethyst is perfectly clear, without inclusions reflecting a vibrant purple color with a hint of red. The back of the pendant mounting is a small platform with pave set diamonds. Dropping from a 16” solid platinum chain, the pendant is regal and one of a kind. A rare African Amethyst precision cut by master gem-cutters in Idar-Oberstein has the color of eggplant with a hint of red, the facets are diagonal checkerboards reflecting light beams at each angle.